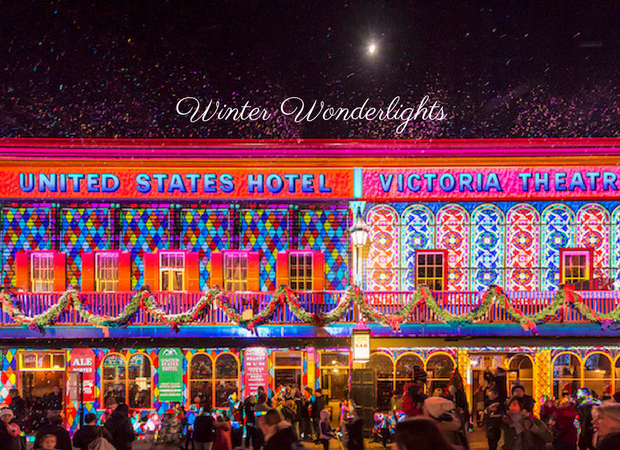 Visit the Winter Wonderlights Christmas in July event at Sovereign Hill, Saturday 1st July – Sunday 30th. Sovereign Hill, 90 mins from Melbourne, is one of Australia’s most iconic tourist attractions, recreating an 1850s gold mining town. It’s like stepping back in time, from the hustle and bustle of Main Street where costumed ladies and gents parade their new-found wealth, to the excitement of the Red Hill Gully Diggings where visitors can pan for real gold, venture underground on a fully-guided gold mine tour, catch a horse-drawn coach and tour the town, visit the 1850s style shops, and watch the wheelwrights, candlemakers and confectioners ply their trades. During July, visitors can enjoy a full day of Christmas excitement with activities for all ages, and as the sun goes down, Sovereign Hill will light up spectacularly each evening after 5.45pm. During the day, the entire Sovereign Hill township will evoke a sense of old-world wonder. Visitors can stroll down Main Street as snow-flakes fall at regular intervals over the Victorian-style buildings, decorations fill the window displays, the smell of Christmas treats and spices fill the air, and traditional Christmas-themed pantomimes are performed. 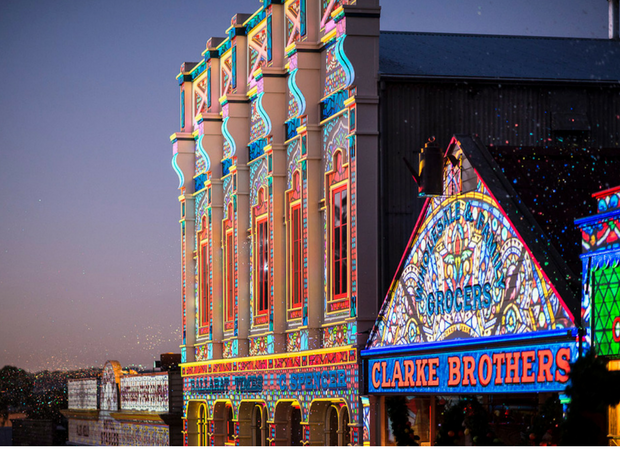 At night, Main Street will sparkle with an amazing light projection show with over 20 of Sovereign Hill’s buildings lit up with large-scale image projections and Christmas animations. Children can also catch the Gingerbread Man as he dashes from building to building, peeking out from the Christmas themed lights and animations! The cottages and gardens overlooking Main Street will also be filled with fairy lights, and candles will dance in shop windows, so no matter where you look, the old-world charm of the 1850s will bask Sovereign Hill in a golden, yuletide glow. Entertainers, including illusionists and acrobats, will also perform, delighting visitors with their magical skills. Saturday 1st July – Sunday 30th July, 2017. Open daily from 10am. The ‘Winter Wonderlights’ show will start each evening after 5.45pm. Win a family pass to the Sovereign Hill Winter Wonderlights! The Family Pass is valued at $150.00, and valid for 2 adults and up to 4 children. To enter: Tell me in 25 words or less why you would love to visit the Sovereign Hill Winter Wonderlights these school holidays? Competition closes 25 June 2017. Full T&C’s can be found here. Our children loved Sovereign Hill and taking our grandchildren to ‘Winter Wonderlights’ would make special everlasting memories for them from this magical place. My twins dream of becoming filmmakers one day. Underneath those beautiful bright lights lies Ballarat’s richest history and golden tradition that would INSPIRE their way! My partners and my last trip here was back in school. My birthday is in July and this would bring back wonderful memories for us. Having never seen snow or been to Sovereign Hill myself I’d love to give my nieces the experience. They’ll be too cool for me soon!!! Such a wonderful, colour-filled way to warm up winter and the inner spirits of my young ones and those of us young at heart. Twin Great Granddaughters would go crazy or [crazier] if I won this prize for them, they love seeing building lit up. I want to take my 2 cousins aged 2 and 3 to experience the time before technology was introduced, and show them the wonderful place! A Winter Wonderlights Christmas in July would put the biggest smiles on my kids faces, we’ve never experienced anything like it. Our GPS is already programmed for Ballarat these holidays – imagine the surprise and joy on faces if we ventured into this Winter Wonderland! Gold! Visiting from Sunny Queensland, rugged up in chilly Victoria on “grandparent patrol ‘ for the school holidays. What better place than at Sovereign Hill to see snow while bonding with the grandchildren. Such an educational, frolicking fun experience for all. There needs to be a positive to our negative cold winter, taking a trip to Sovereign Hill would certainly be a positive for me! School holidays are looming and the the wails of ‘I’m bored” are guaranteed (despite having the internet, video games, the movies, indoor play centres etc) I’d love for my kids to see how life was lived in the gold rush days, the harsh reality of doing it tough! Sovereign Hill is not only a fun place but it’s eye opening and though provoking and my kids need that! Lessons and education aside, The Winter wonderland experience sounds like pure family fun, a unique experience that we would love to be part of. Love to donate to my cousin & her 4 kiddies (who are as good as gold) & even better as our grandparents came from there, so nostalgia! This would give us a chance to see them on the streets of yesteryear. What a treat it would be to take my family to Christmas in July at the beautiful Sovereign Hill!! My Children love anything to do with Christmas,Bright Lights and excitement,plus they`ve never been to Sovereign Hill. My children love anything to do with Christmas.bright Lights and have never been to Sovereign Hill. I’d love to relive the wonders of Sovereign Hill with my five children. I have so many happy memories of visiting as a child. For the sheer exhilaration of it…the infinite delight and exultation experienced within my family. Now that’s something to behold!! Stepping back in time, sublime! Sovereign Hill, Winter Wonderlights and the expressions on 3 very special little people’s faces as snow touches their faces is an experience money could never buy, but to be treasured forever. The joy of being rugged up with the ice sculpting , snow machine, and the lighting would be magical and we would love to experience this prize! What a spectacular to take the kids to see these school holidays. My kids have always wanted to visit Sovereign Hill and what better way to do it. We would love to see this spectacular show, the kids playing in the white fluffy snow, With all.the beautiful lights, It would be a tremendous delight! Catching a gingerbread man we’ll add that one too. been planning a trip to sovereign hill for a while, this is another great attraction the area has that we would love to experience. I’ve just recently had a child and my neice and nephew love Sovereign Hill and would absolutely love to go with my family as they don’t get out of the house a lot but would love to see some snow and pretty lights! I’d love to treat my boys to this mystical winter wonderland – and of course have a crack at striking it rich at Sovereign Hill! We would love to see the charm of the olden days and Australian history mixed with the magic of the amazing entertainment and beautiful lights. Eldest is learning about the Gold rush at school, so will be win win & fun fun on a multitude of levels . Love Sovereign Hill!!!!! The only way to make Sovereign Hill even better, is by incorporating the magical whimsy of Christmas. My grandkids will flutter with excitement if I take them to Winter Wonderlights because they are like moths to a flame when they see bright coloured lights. What an amazing way to bring Australian history to life for my granddaughters. so I know they would love it too. 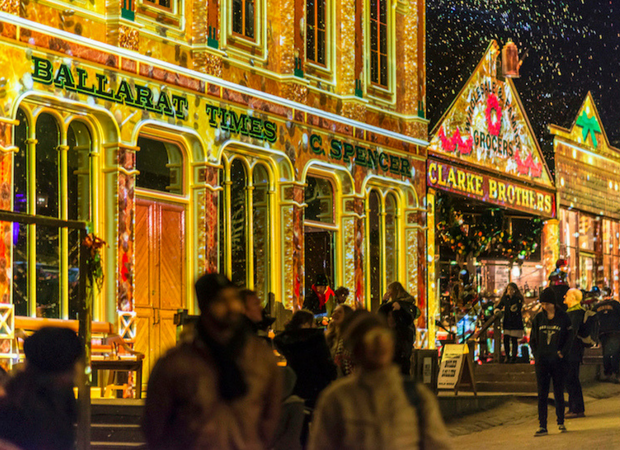 I want grab the kids and head to the Ballarat this July as Sovereign Hill explodes in a whirl of bright lights, snowflakes, carols and a most amazing look back to life in the 1850s Goldrush Era, Christmas style! Christmas, by far our favourite time of year, only at Sovereign Hill, there’s a combination of SNOW, lights and yesteryear, now that’s something to cheer!